Statistics show that conference-goers are more likely to attend a conference that makes their family feel welcome. In Pigeon Forge, attractions, family-friendly shows, and casual restaurants are right outside your door. Undecided on how to package your annual convention? Not sure you can come up with another theme idea? Lean on our staff for recommendations that will take your goals and objectives and help you position your Smoky Mountain conference as your best yet. It’s true a picture speaks a thousand words. Let us do the talking for you by assisting with a pre-event mailing or promotional assistance so that your potential attendees understand the FUN and value of our destination. We can also provide you with tools to make booking restaurant reservations and extended stays that much easier. 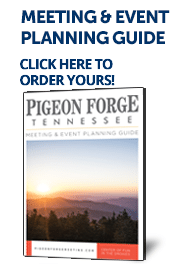 The first step in building positive attendance to your next conference in Pigeon Forge is as easy as submitting an RFP. Let our sales team work for you!